This is a simple love perfume that you can make with your favorite scent. You can use any brand of perfume but I prefer romantic smells. A favorite of mine is ‘Love Spell’. A favorite of mine is ‘Love Spell’. You can get it from Victoria’s secret and its pretty awesome. Love perfumes are wonderful because you can essentially take the magick with you. Wearing the magick, having it attract someone suitable. This spell is so simple and fun I used it often in 9th grade and had plenty of great dates because of it. 🙂 This is more of an attraction spell. a bottle of your favorite perfume or cologne. Mix the the ingredients and place them into a bottle. (You can buy spray bottles for 99cent from Wal-mart!) Light a pink candle and bless the perfume. 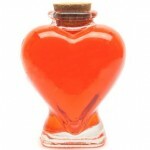 Place the bottle onto your altar in front of a picture of the person you want to attract. Leave the perfume on your altar for five days and five nights. If you do use the pink candle let the candle burn down. Use the perfume until you attract a suitable mate. This is a simple but effective love perfume and I hope you enjoy it! Also I wanted to give a huge thanks to my good friend Serenity, (I am on Facebook make sure you add me:) ) who recently showed me how to make my own oils, and herbals oils. She also posted it in the Kitchen Witchery section in the forum so please check it out. We have monthly contest and prizes. What spells should I put up next? I have been focusing on love spells but now I want to know what types of spells are you guys looking for? Leave me a comment below please!